► The off-roading icon snapped again! 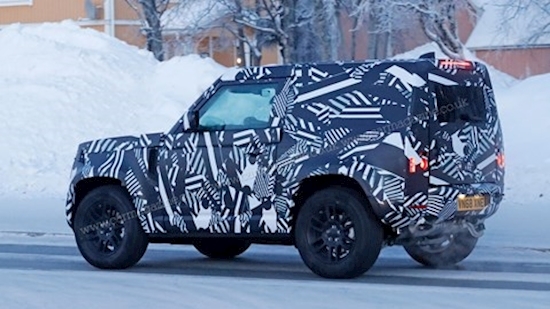 Another day, another substantial batch of pictures of the new Land Rover Defender from our spyshot friends. 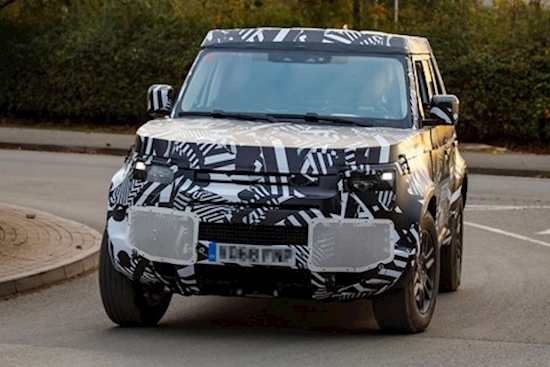 The new picture above shows the new Land Rover Defender performance testing on – where else – the Nurburgring, and appear to be of the shorter Defender 110 being put through its paces. CAR understands the Defender is coming in at least two variations next year as JLR looks to capitalise on its cult status. Our sources suggest there’ll be a 90 and 110 version, and the short overhang here suggests that we’ve snapped the former. It’s also similar to the model we saw cold weather testing in Arjeplog, Sweden, just as few weeks ago (below). We've been busy gathering more details on the new Land Rover Defender, codenamed L851 and due on sale in showrooms in 2020 - bringing the world-famous-but-dormant nameplate back from the dead. 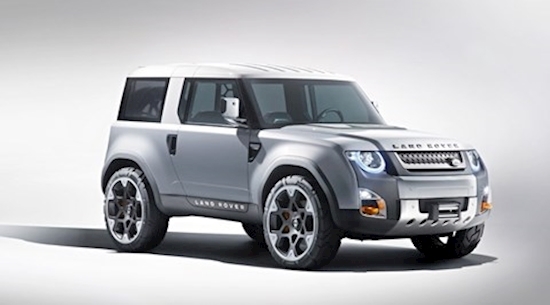 It is now certain that Land Rover will launch a Defender Sport model, as well as myriad bodystyles - and a battery electric version is in the works too, slated for launch in 2024. 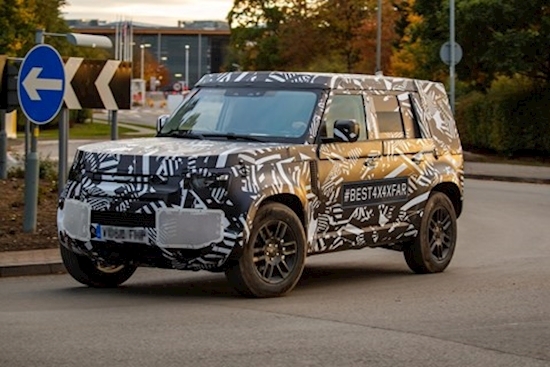 In October 2018 we first published photos capturing the first prototypes of the new Defender on test near the Jaguar Land Rover test facility in Gaydon, Warwickshire. Before this only heavily disguised, cut 'n' shut test hacks had been seen on the public road and now more pieces of the puzzle are falling into place. Land Rover is busy readying its most important new launch for years. For many, the Defender is the backbone of the brand, but there has been no out-and-out mud-plugger in the range since the original went off sale in 2016. Now that's all set to change with a major investment to relaunch the nameplate. So the new Land Rover Defender will form an entire family, in much the same way that the Discovery range has branched into the Sport sub-brand. The plan is to offer different models to laser-focused user groups - as evidenced by the plan to launch with an array of accessories such as roof-top tents and other outdoors-focused options. Study the pics closely: they prove the new car will get independent rear suspension (a hint of its dual-purpose, on-road ability) and it looks like the side-hinged tailgate will return, too. The new Defender will dip into the JLR group's confection of aluminum platform know-how - the body-on-ladder-frame construction is out, and a new monocoque architecture is in, according to our sources. The result is a lighter, stiffer and dimensionally more flexible vehicle which will in future cover the full spectrum from mountain bruiser to boulevard cruiser, from Heritage to Autobiography, from workhorse to boulevardier. Although all derivatives share the fixed points of the same basic architecture, LR will offer a choice of axles, tyres, transmissions and suspension calibrations to meet a wide range of customer requirements. Land Rover copped some flak for its 2011 concept car, badged DC100 (above), but the spirit of its modernist approach - and variety of flavours - is said to live on. Further down the line, we hear word of Project L860, the Defender Sport due in 2026. 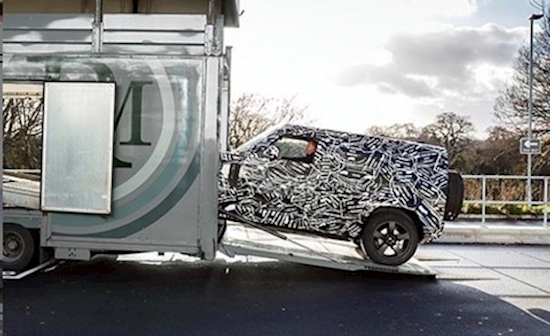 JLR has revealed testing of the new off-roader is already underway – and it’s also being tested in America, as it’s the first Defender to touch down across the Atlantic. JLR the says the testing will ensure the new Defender is the ‘most off-road capable Land Rover vehicle ever’ while ‘operating in temperatures from -40F to +120F while driving the test vehicles on- and off-road at altitudes of more than 13,000 feet above sea level.’ That should keep the purists a little bit happier, at least. The new image doesn’t really show any new aspects of the Defender, but it does confirm its ‘Velar plus old Defender’ styling language, which is what we were always expecting. ‘We are enormously excited to be revealing the first member of the Defender family during 2019 with UK customers taking delivery in 2020,’ said Rawdon Glover, Jaguar Land Rover UK managing director. For everything else you need to know about the new Land Rover Defender, keep reading. The Defender Sport is still a long way out. But L860 has our full attention because, similar to Defender, it has the premium entry-level outdoors niche all to itself. While the box-shaped classic is visually and technically off-road-biased, the Sport edition has more of an on-road and lifestyle flavour with plenty of convenience features in addition to the full set of mountain climbing gear. Think of it as a modern Suzuki Jimny/Jeep Wrangler for the well-to-do in-crowd. To be built in low labour-cost Nitra, the Defender Sport will be available as a full battery electric vehicle. Electrification is coming to the Defender family, but most buyers will initially buy internal combustion engines, while battery tech and infrastructure play catch up. Engineering sources have confirmed to CAR quite a few details about the engines and specs of this quintessential reduce-to-the-max British SUV. Buyers will be able to select the number of doors as well as the bodystyle, trim level, character of the car and, of course, the flavour of north-south engine. Expect the familiar JLR-group 2.0-litre four-cylinder petrol and diesel engines to provide the entry level, but you're also going to see a selection of new inline six-cylinder engines join the Ingenium family as the old V6s are phased out. Expect 3.0-litre petrol and diesel motors available. All engines are artificially aspirated; some even feature an additional electric charger for an extra helping of take off-grunt and acceleration boost. The first three Land Rover Defender models to hit the showrooms are tipped to be a LWB four-door metal-top, the SWB two-door metal-top and its soft-top sister model. These pictures of the new Defender emerged as the 2018 Paris motor show was in full swing on 2 October 2018. We took the opportunity to ask Jaguar Land Rover CEO Ralph Speth about how the new Defender project is going. 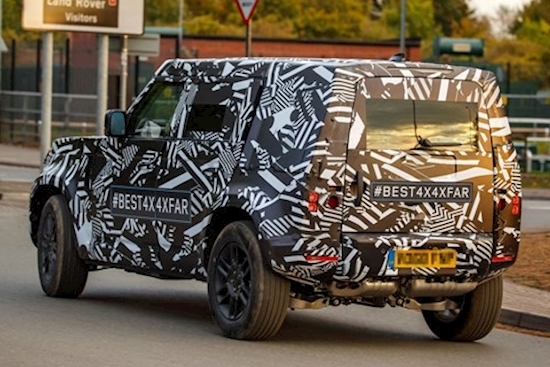 'The Defender is an icon and we are working on it now,' he told CAR magazine. 'It's a true Land Rover, a key part of the brand.' He refused to be drawn on further details, but hinted it would be ready by early next decade. A spokesman added: 'Jaguar Land Rover runs a wide range of engineering and technology development programmes. We are unable to comment on the specific nature of these programmes. However we can confirm that the Defender programme is progressing well and has reached an exciting stage of its development. This is the first official guidance on the Defender launch - and it points to a motor show debut at some point later in 2019, in roughly a year's time. Let's say the Frankfurt motor show.